I welcome all families and members of the Mater Dei College community to the 2018 academic year and our 25th anniversary for the College. Whilst much of the College community were enjoying holiday festivities, our College Grounds and Maintenance Department under the guidance of Business Manager Ms Kerry Davidson, were busy refurbishing the College in time for the staff and students to return. Over the holidays the College has commenced a painting project with many doors and walkways painted and a number of classrooms have new desks to start the year. The College ICT Team were also very busy with the migration of the College network to the Catholic Education WA platform. This migration unfortunately has not been as smooth as hoped and we have endured interruptions to IT services. My thanks to the ICT team for their work in trying to resolve the issues and to the students and families for your patience during this time. On Thursday at the College Assembly, we had an opportunity to acknowledge the academic achievements of some of the students in 2017. Congratulations to the students who achieved very sound results. In addition we presented 36 students with Academic Honours badges for achieving Academic Honours in Semester One and Semester Two last year. It is wonderful to start the year acknowledging the efforts of our students. 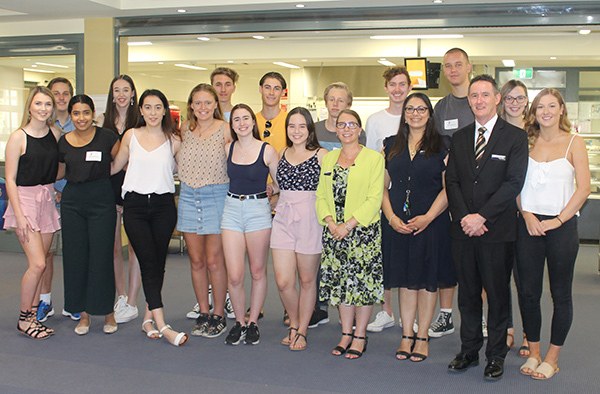 Please refer to the article on Year 12 WACE Achievements from Mrs Tamara Boyer, Deputy Principal and the article on Academic Honours from Mr John Sullivan, Deputy Principal for further details. At the first assembly for the year I reminded all students to strive for personal excellence. The students have been informed of a new Homework Policy and amendments to the Assessment Policy. This year we have also reintroduced the College Planner at the request of students last year. Students have a greater chance of reaching their potential when the home and school work together in a partnership. I urge parents to please encourage the use of this planner to help organise homework and study. The Year 12 Ball held on Saturday 3, February was a lovely way to commence the school year. Thank you to Mr Green and the Year 11 students for organising the traditional Mater Dei Pre-Ball function in the Bernie Boss Hall. There was a great buzz amongst the families and friends who attended. Thank you to Mrs Davina Croasdale and staff who attended the official Year 12 Ball at the Pan Pacific Hotel. An enjoyable night was had by all. The Year 7 Parent Information Evening had a relaxed start this year with an informal BBQ hosted by the Parents and Friends Committee. Thank you to the many families who attended and the P&F Committee for their hospitality. The College AGM is scheduled for Tuesday 27, February at 7pm in the Catherine Centre. I encourage parents to attend. Please refer to the information in this newsletter. Parents are welcome to attend our Opening College Mass on Thursday 15 February at 8.50am in the Bernie Boss Hall. This is a lovely way to start the school year as we join together in praying for the Lord’s blessing for the school year. The official 25th anniversary celebration Mass is scheduled for the College Foundation Day on Friday 23, March. This Mass will be celebrated by the Most Reverend Timothy Costelloe, Archbishop of Perth. The afternoon congestion can be quite severe outside most schools. A reminder to all families to please adhere to the designated drop off and pickup areas and to exercise patience and courtesy. I ask parents to please refrain from parking in the main driveway and also on the road along Treetop Avenue. Cars in the left hand lane are asked to use the carparks outside the main administration building or to park along the drive through outside the main administration and leave the College via Pioneer Drive. An alternative is to collect your child a few minutes later at 3.30pm. I look forward to your support in keeping our students safe. As we commence the year, I strongly encourage parents to contact the College if issues or concerns arise throughout the year. I look forward to working in partnership with families at the College and I welcome parents speaking with me in person rather than posting on social media. Best wishes for a successful year ahead and I look forward to meeting many families throughout the year. Technology offers all us wonderful opportunities and when used correctly the possibilities are almost unimaginable. However, when used incorrectly it can have dire consequences. 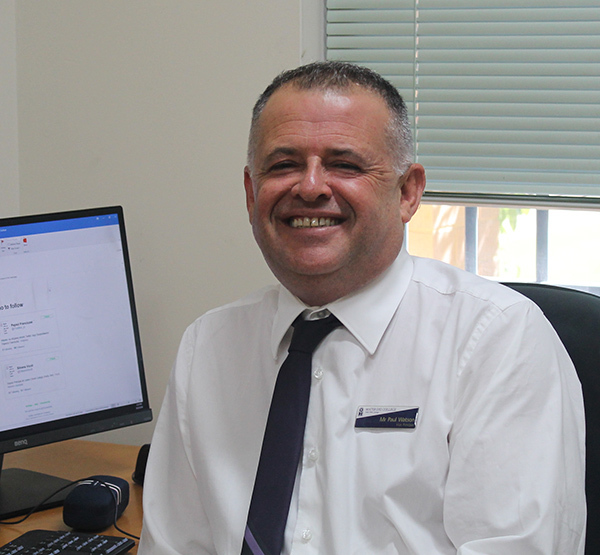 The effects of inappropriate online behaviour is of great concern for parents, teachers and students, as we all seek to protect the well - being of children, ourselves and the entire Mater Dei College community. The College’s Responsible Use of Technology Policy is very clear in its expectations of appropriate use and I want to stress this is non-negotiable. We expect that all members of the school community demonstrate the values we hold so dear to us as members of a Catholic school, not only through our face to face interactions with others but also when online. 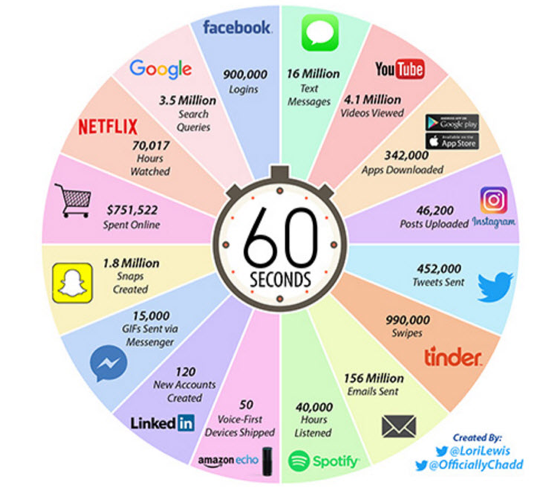 Social Media is not about technology, it is about relationships. Students crave a sense of belonging through these forums, however, they also place themselves at risk from cyber bulling and leaving a digital footprint of their own behaviour that will follow them for the rest of their lives. If students are being treated badly online we strongly encourage them to seek support immediately either from within their family and/or school. It is often very difficult to stop but not impossible and people must be held accountable for any behaviour that has a negative effect on others and themselves. As parents, teachers and students we all have a role to play in doing our best to eradicate any form of inappropriate online behaviour. 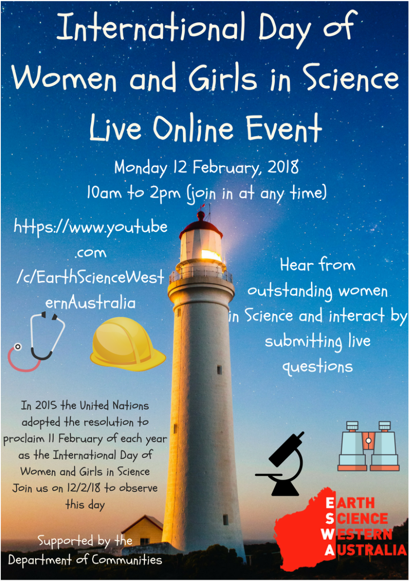 If you wish to learn more about a variety of strategies to enhance the support of protecting our children when online, The Office of the E-Safety Commissioner (https://www.esafety.gov.au/ ) and Ysafe (http://www.ysafe.com.au/ ) are just two websites that offer a variety of strategies and resources that can greatly assist in monitoring and protecting student online behaviour. Congratulations to the following Year 12 students from the graduating class of 2017 for their WACE achievements. Last Thursday these students attended our first whole school assembly for the year where we were able to celebrate their successes in front of the College community. 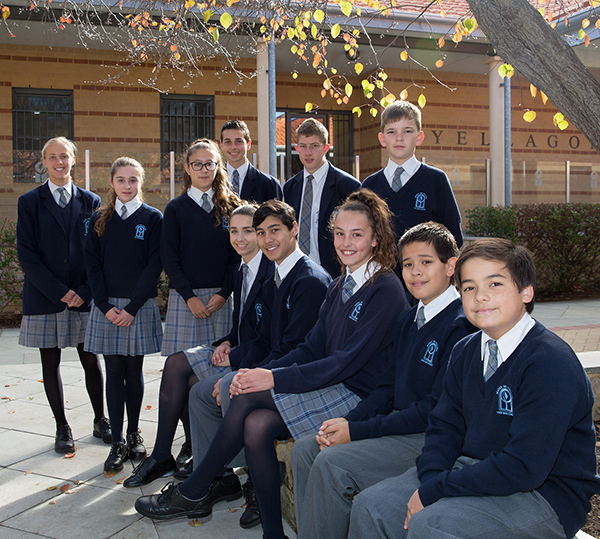 Seven students achieved an ATAR of 90 and above, 16 students received either a SCSA Certificate of Distinction or Certificate of Merit for the points which they accumulated over their studies in Years 11 and 12, and several students were the recipients of university scholarships. Please note that as the universities have not officially notified us of all scholarship winners, students whose names are not mentioned below will be published in the next newsletter. Tenille Reidy-Crofts – Our highest achieving student with an ATAR of 97.40. Tenille was also the recipient of a Certificate of Distinction and is now enrolled in the Bachelor of Biomedical Science course at UWA. Ben Brummage – 95.40. Ben was also the recipient of a Certificate of Merit as well as the ECU Engineering Excellence Scholarship to the value of $20,000. He has accepted a place in the Bachelor of Engineering course. Muskan Sharma – 94.85. Muskan is enrolled to study Speech Pathology at ECU. Jason Hemetsberger – 92.55. Jason was also the recipient of a Certificate of Merit and is enrolled to study Engineering and Physics at UWA. Tristan Hobley – 91.40. Tristan was also the recipient of a Certificate of Merit and is enrolled in the Bachelor of Engineering course at Curtin University. Bruce Patmore – 91.15. Bruce is enrolled to study in the Bachelor of Science course at UWA. Lauren Kincaid – 90.15. Lauren was also the recipient of a Certificate of Merit as well as the Curtin University Principal’s Recommendation Award including a scholarship to the value of $1000. She is now enrolled to study Occupational Therapy. Catherine Acres (Bachelor of Education: Secondary - UNDA). Katherine Bennett (Occupational Therapy - ECU). 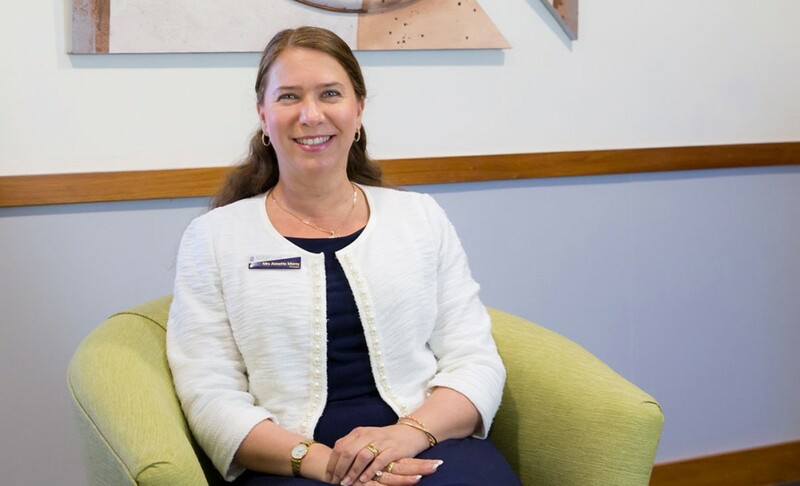 Kristen Clarke (Primary Education - ECU). Caitlin Easton (Bachelor of Education: Secondary - ECU). Tahlia Fenton (Bachelor of Arts - UWA). Tahlia also received the UWA Excellence Award which includes $550 to assist in purchasing books and other resources. Alec Johnson (Bachelor of Arts: Architechture - UWA). Elaina O’Connor (Diploma of Musical Theatre - Australian Performing Arts Network). Dallas Povee (Nursing - ECU). Chelsea Reid (Psychology - UWA). Matthew Slocum (Bachelor of Engineering- Curtin). Gabriella Wells (Nutrition and Science - ECU). Gabriella Wells also received the ECU Scholarship Award to the value of $1000. This scholarship is awarded to students who demonstrate academic excellence and endeavour, leadership and a commitment to ECU’s core values of integrity, respect, rational enquiry and personal excellence. Congratulations to all of these students for their outstanding efforts which are indicative of all the successes their futures hold. Academic Honours is awarded to students who achieve two thirds or more A grades on their semester report. Congratulations to the following students who achieved Academic Honours in 2017 Semester 2. This year we have introduced an Academic Honours Badge which was presented to students at our first whole school assembly this year. Academic Honours Badges are awarded to students who achieve Academic Honours in both Semester 1 and Semester 2. The following students proudly wear 2017 Academic Honours Badges for their outstanding achievements last year. At Mater Dei College we believe that learning can be enhanced when students are provided new opportunities to review, reinforce and apply what is learned at school, and homework and study are ways of achieving this outcome. This year we have introduced a Homework Policy which we ask parents to read and become familiar with. Responsibilities of the school, of students and of parents are detailed in this policy which can be read in its entirety in the Student Planner on pages 12-13. Homework should be done in time-slots organised around family, leisure, sport, part-time work and other commitments. It is suggested that students work for short concentrated bursts i.e. twenty to forty minutes of fully focused effort interspersed with short breaks. Because of course demands in Year 11 and 12, students who are studying at ATAR level, and those who are serious about their studies would be expected to work for some time during the school holidays. Any students who would like assistance to create a homework/study timetable are encouraged to visit us in Student Services. The Annual General Meeting for the College Board and the P&F Committee will be held on Tuesday 27, February at 7.00pm in the Catherine Centre Breakout Area (upstairs). This is a great way for parents to contribute to the school community, to support children in their education and to meet other parents. All nominations need to be submitted by Friday 23, February. To nominate for a position on the College Board, please download and complete this form and return to the administration. To become involved in the P&F Committee you can download and complete this form and return this to the administration. In order to graduate from high school and achieve the Western Australian Certificate of Education (WACE), all students are required to demonstrate a minimum standard in literacy and numeracy. The OLNA status of all students in Years 10-12 can be accessed under school reports on SEQTA. 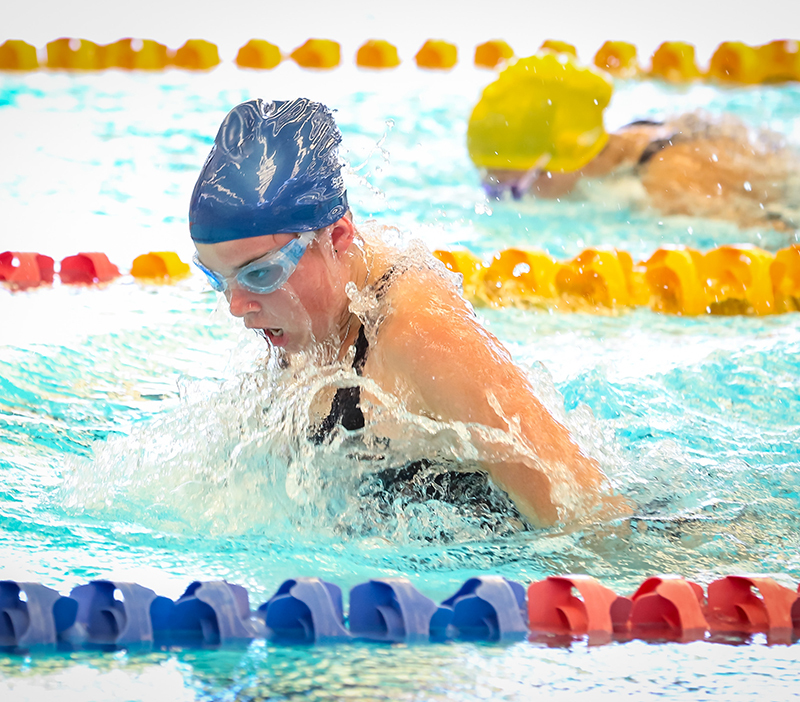 The Years 7 - 12 Inter-House Swimming Carnival will be held at the HBF Arena in Joondalup, on Friday 16, February 2018. The carnival is COMPULSORY (regardless of participation in events), for all students in Years 7 - 9 and selected students in Years 10 - 12. All remaining students in Years 10 - 12 are required to attend the College as per normal. Please note that no new content will be delivered in lessons that day due to some senior school students participating in the carnival. Students are expected to make their own way to and from the HBF Arena. Students are required to be at the venue by 8.30am sharp for normal Homeroom duties. The carnival will commence at 8.45am and conclude at 3.00pm. For those students unable to make their own way to and/or from HBF Arena and for those students relying on Path Transit, bus shuttle services will depart the College at 8.00am and return to the College at 3.15pm. To indicate if you child/children needs to access this shuttle service, click on the using school transport icon located on the Event Invitation email sent to all parents. Please note, the program of events is designed to accommodate all swimming abilities. If any parents/guardians would like to be an official on the day, please reply via the link in the email sent to all parents regarding Parent Helpers. Café facilities at the HBF Arena will NOT be available for students to access. Students will need to bring their own food and drinks for the day. Note: Items such as personal music devices, mobile phones and magazines are NOT to be brought to the carnival. Taneesha was one of only 24 footballers from around Australia whose application to the 2018 Tim Cahill Ambitions Tour was successful. 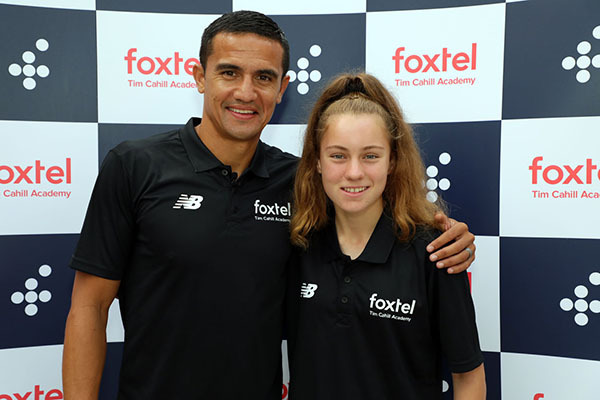 Taneesha’s application was so strong that she was awarded a scholarship which included a fully-paid trip to Melbourne to participate in the intensive soccer program, sponsorship from New Balance and many other perks and incentives, including meeting Tim Cahill himself. Congratulations Taneesha, we wish you all the best for your future soccer career, as we’re sure you’ll be a star! 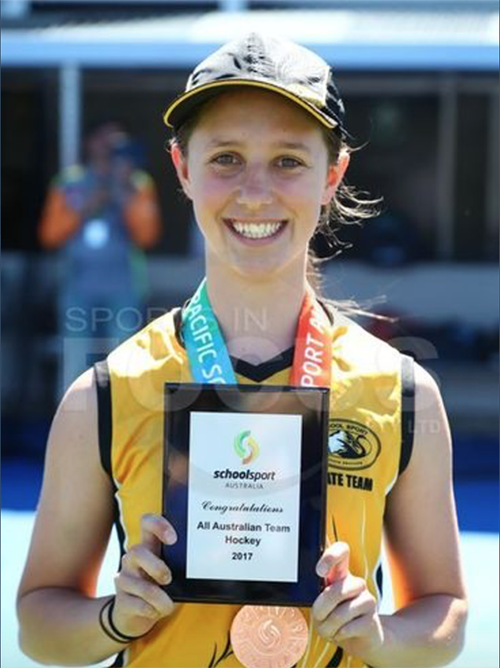 Caitlin travelled to South Australia in December last year as a member of the U16 WA State Hockey Team to compete in a national tournament. Her team performed amazingly well and managed to secure a bronze medal. Caitlin has since been selected as a goalkeeper to represent Australia in the U16 National Hockey Team and will be travelling to South Africa in June 2018 to compete against teams from all around the world. Congratulations Caitlin, and we wish you all the very best for your upcoming competition. Laura Doleman was selected from thousands of dancers to perform with the Dream Creative Dance Company, founded by one of Australia's most esteemed creative directors Marko Panzic. The company performed in Sydney during January to sell-out performances. 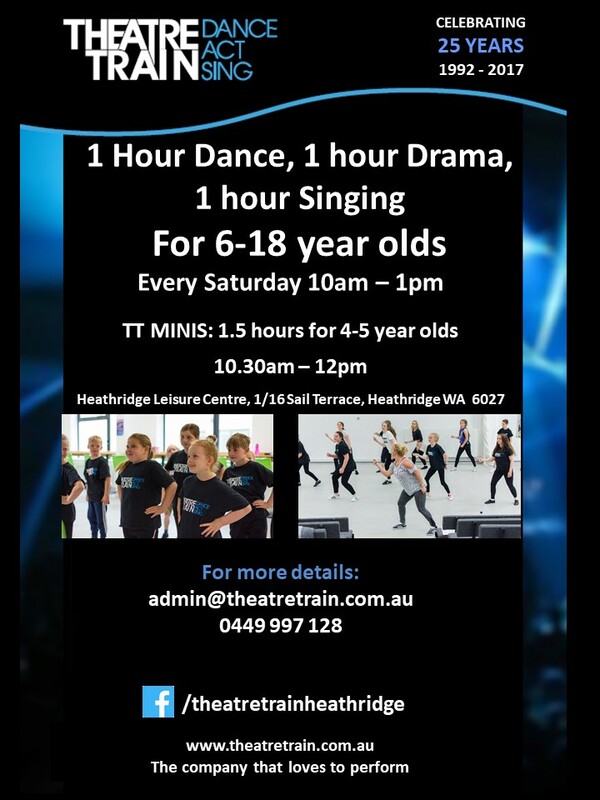 They have just announced that they will also be performing with the Dream Dance Company live at the Australian Dance Festival in September 2018. 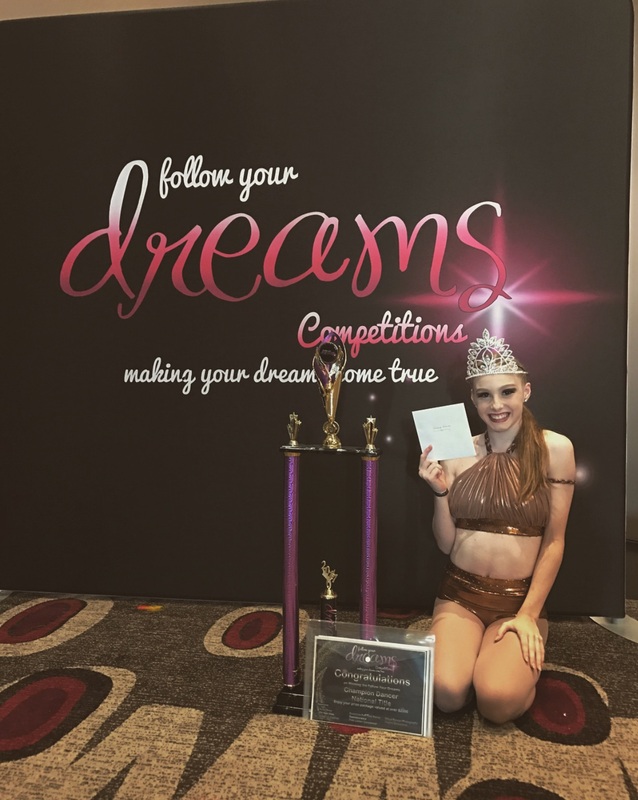 In addition to this, Laura also won the National Title, U15 Championships at Follow Your Dreams National Dance Competition in Melbourne, where she received over $2000 worth of prizes. Laura is such a talented dancer and is following her dreams. We are all so proud of her achievements and wish her well for her future endeavours. Rhiannon Clarke (Year 10) has been awarded her Bronze level card. Congratulations. 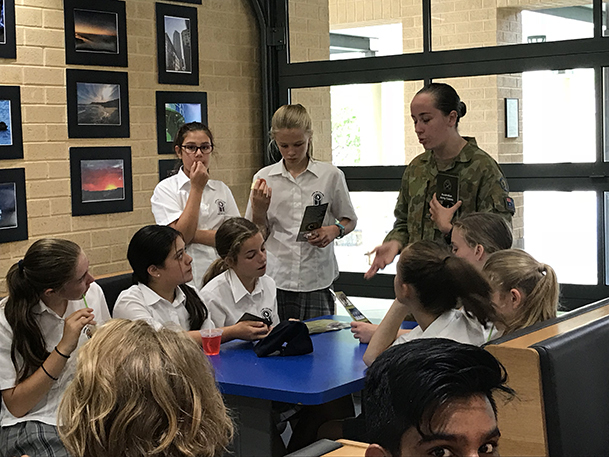 This week, cadets from the 507 Cadet Unit came and spoke to our students to provide information on the Army Cadets program. If students want to experience things in the great outdoors and develop organisational, team and leadership skills this is a great program run for 13- 17 year olds. The program can go towards your WACE Graduation as well. I will be represening Mater Dei College in the 2018 Saddles Plus Equestrian Interschool’s Festival held over the first term break. The festival will be held over three days from the 18 - 20 April at the State Equestrian Centre. This festival will include the disciplines of showjumping, showhorse, dressage and combined training. 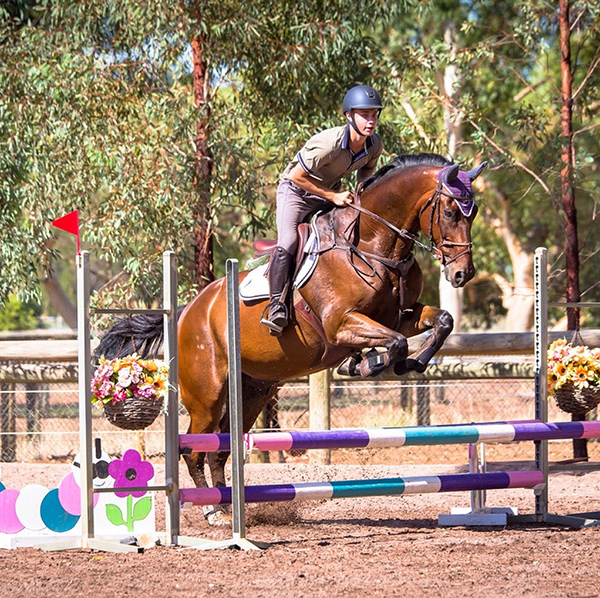 Another festival will be held from the 17 - 18 March for eventing at the Capel Regional Equestrian Centre. This will give students the opportunity to compete to represent our school in their sport along with hundreds of other students from across the state. If your child/children may want to take part in this opportunity they must obtain a copy of the qualification sheet. All horses and riders must be EA registered and have the horses qualified for the event. The qualification sheet needs to be filled out with the desired information and handed into the EWA office by 5:00pm on 6 March, 2018 for eventing only. Other disciplines need to have their qualification sheet handed in on 12 March. Students are responsible for their qualification sheet and classes on the day. The classes entered will be paid for by parents/guardians. All students must wear their winter academic uniform over their breeches/jodhpurs. The WA Children’s Book Council invites students to make their own story book. Closing date Friday 8, June 2018. Year 7, 2020 Enrolments – if you have not enrolled siblings for Year 7, 2020 please contact the Enrolments Officer. Interviews for Year 7, 2020 will start in March 2018. For further enquiries please phone our Enrolments Officer, Ang Lourens on 9405 4777 or email: enrolments@mdc.wa.edu.au. In addition to visiting the Mater Dei College Uniform Shop and placing your uniform order in person, Matrix Uniforms (supplier of Mater Dei College Uniforms) now offers the convenience of online ordering. Please note this phone is only operated during school uniform shop hours. If we are unavailable, please leave a message and we will call you back.